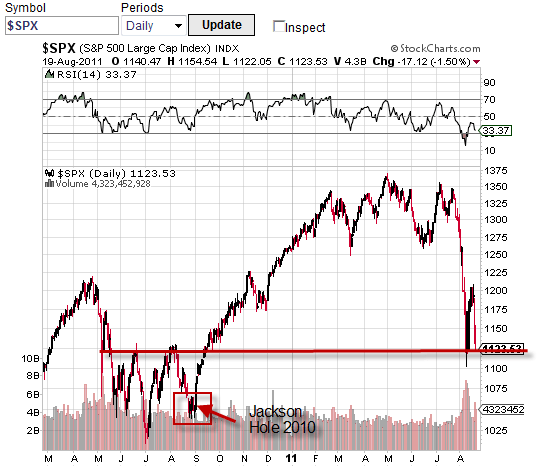 In the chart of the S&P 500, above, you can see how the index has taken a sharp decline since the highs of mid-July. It is now below its 200 day and 50 day moving averages (red and blue lines) and has broken several long term trend lines. Furthermore, the 50 ma has crossed below the 200 day ma, forming what is widely known as the “death cross” which is a quite reliable statistically proven technical indicator [see here (1) for a recent article on the current “death cross” event]. While not perfect, as no indicator is, the “death cross” has managed to sidestep the biggest part of every recent bear market, while its counterpart, the “golden cross” has captured significant gains during bull markets. However, it should also be noted that support at the 1120 level has been tested several times and so now the bears will have to push through that level to confirm that we are actually in the beginning days of a new bear market. to “buy and hold” which is the conventional wisdom and which I believe is quite ineffective in today’s volatile markets since the major indexes are still far below where they were in 2000 at the beginning of the “tech wreck” more than 11 years ago. to head for the safety of cash which many investors have done or to head for the safety of Treasury bonds and bills which have also seen a huge influx of funds in recent months and days. This strategy gets you out of harm’s way if the market indeed does continue its downward trajectory. to use put options, either as portfolio insurance on currently held positions or as directional bets in search of profits. So from the above discussion we can conclude that we are at the very least in a significant correction of an ongoing bull market or either in or close to entering a new bear market. Coming days will tell us which way things will go and confirm this one way or other. Whatever happens, exchange traded funds offer the power and flexibility to seek profits in any market environment. 1. S&P 500 “Death Cross” Now in Place! What are the Implications? Previous Your Savings and Investments Will Be in Dire Jeopardy Going Into 2012 Unless…..